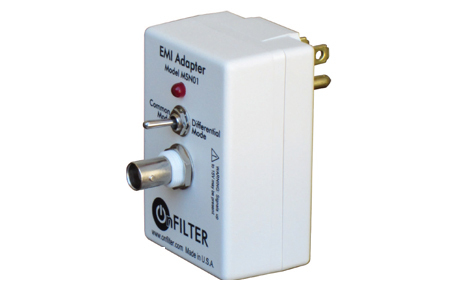 OnFILTER’ EMI Adapter plugs into your power outlet, separates high frequency signals from power line voltage and provides 50 Ohms output to BNC connector. You can observe waveforms of noise on the screen of your oscilloscope or analyze noise spectrum with your spectrum analyzer. 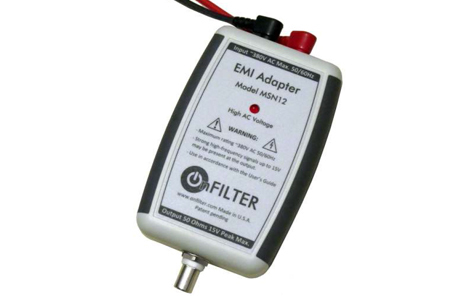 EMI Adapter can be switched between differential (normal) and common mode settings providing complete information to your instrument.